I was hit cold yesterday as I read the news. Google did a little mistake by announcing the numbers too early. If you are not in the stock market business you may ask why this is a problem. And really, it shouldn't. The question remain, who is to blame for the $24 billion dollar loss in 8 minutes? The stock market trade was halted, and the NASDAQ was under pressure. 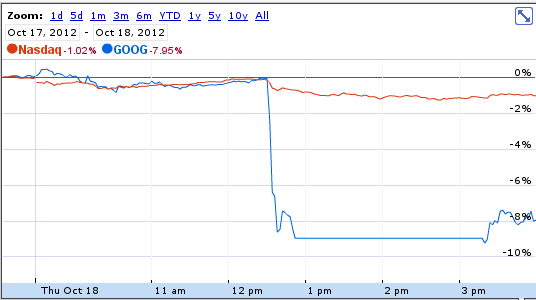 I say both, Google and the stock market. 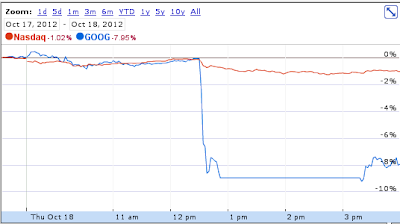 It wasn't very pro-like to have such a slip with a company as big as Google Inc. But the reaction of the stock market was absolutely ridiculous. A mirror for the complete abstinence of reality. A nervous system that can break in minutes. And on this strange system our wealth relies? I think we need changes. Yes, changes, so that a single mistake by a company can't ruin people's life. Now again, I read articles about "Has the new internet bubble burst?". Is that so? If yes, who created the bubble? The stock market did. The unscrupulous broker that would sell their mother if they could get money out of it. But to be fair we have to ask: Is this really a new internet bubble? Or just a normal business on the stock market, that, once again, gone wrong? While pathetic devotees of fruit companies rejoice, it doesn't change everything. For the normal user and customer, this doesn't influence negatively. Maybe the opposite. Seeing the big giant Google is vulnerable will bring back some sympathy. So don't go to hard on Google. It might come back to you one day. Especially with that fruit company, you should know it from the past.